The Tree Swallows have arrived back home here on the Witch’s Island. I love these birds because of their grace and beauty and because of their swift flying style. It doesn’t hurt that they love to eat flying insects, and lots of them! With all the damned black flies and mosquitoes around here they’ll never go hungry. Go you swallows, go! The chosen palace this year is apparently the White House. Every year Wills and Kate (Why did I call them that, you say? Well, Just because I can. It’s good to be me.) spend their first few days deciding which of the two available palaces they will spend the summer in. Usually they choose the Duracell house in the back yard but this year, for the first time, they have chosen the White House on the telephone pole in the front yard. I have no idea what would make them choose that one but maybe they just wanted a change or maybe it’s a little more upscale for the royals. Either way I have a great view of both birdhouses so I can watch the progress as they set up house among our scarlet runners and hanging flags. Wills guarding his family home. Whichever house they’re in the Grackles still try to steal their nesting material. The Swallows have to stay on constant guard to protect their babies. Lousy, lazy Grackles! Go collect your own nesting stuff! It’s fun to watch the much smaller swallows chase off the bigger birds. 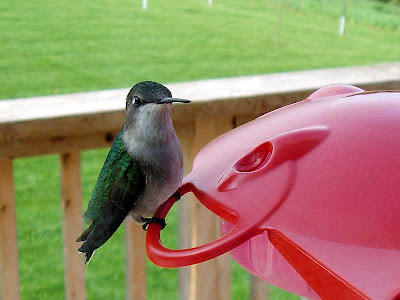 The Ruby-throated Hummingbirds have also returned. Almost as soon as I set out the feeder on the kitchen window the hummers start showing up and then the “Wars” start. One bird will decide that he (or she!) will be in control of the feeder and will spend way more time chasing off the others than actually drinking. It’s funny to watch the little buggars buzzing back and forth all day. We did manage to snap a couple of shots of one female who managed to get a drink or two before Mr. Bully Boy spotted her. Really, Mrs. Hummer. You should stop posing and get a drink while you can. The vegetable garden is starting to take shape out in the backyard. The cucumbers that I started on April 22 (way too early again this year, when will I ever learn?) had gotten way too big and needed to be transplanted outside but the weather has been just terrible. Some days were as hot as 22C and then there would be frost the next morning. During May we had rain for 27 straight days. Yup, that’s right, cold and depressing. I hope this doesn’t indicate that our summer is heading in that direction. I moved the starter plants out to the potting shed a couple of weeks ago to start hardening them off. 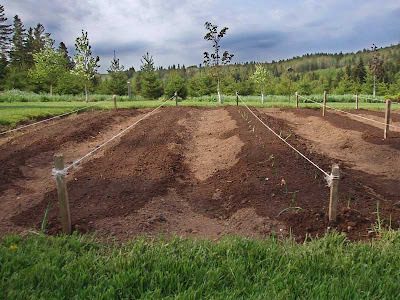 Anyway, Hubby has gotten the ground ready, adding some manure and rotilling again. 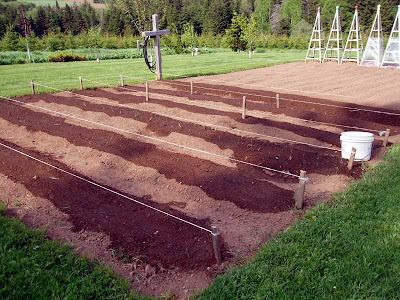 He set the obelisks out for the cumbers and planted the first four with 3 plants each. Of course, the next day there was high wind which twisted off about half of my babies. We lost a couple more to transplant shock. 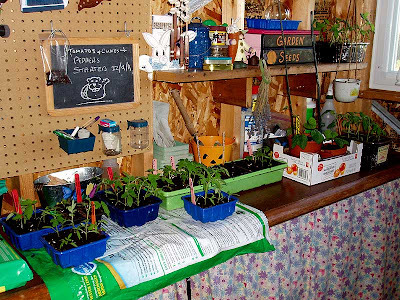 Hopefully there are still enough left in the potting shed to refill the empty spaces. We’re going to need all the cucumbers we can get for pickling this fall. The onions were already out of the ground in a few days. Half of the vegetable garden has been planted out. We have also gotten six rows of seeds planted. 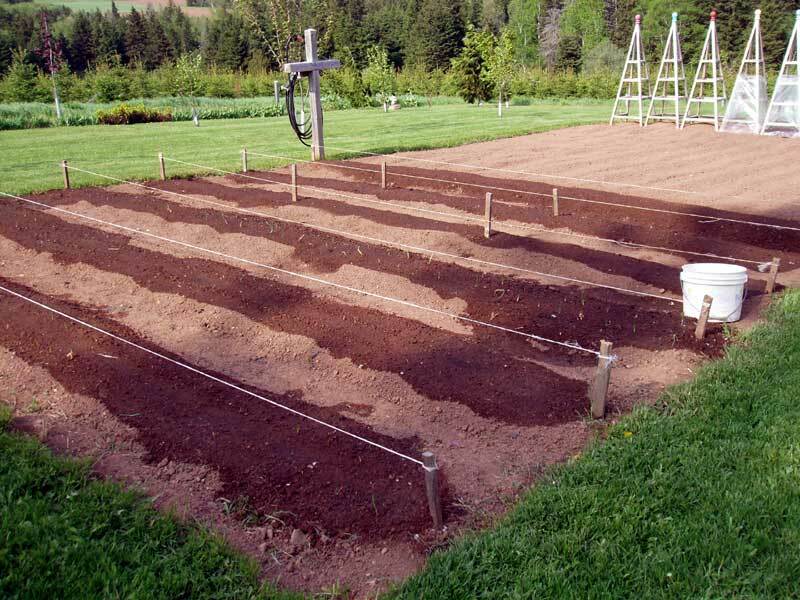 There are three double rows of onions, both yellow and red, a row with three varieties of beans, green, yellow and purple, a double row of carrots with radish markers and a double row of beets in three varieties. The onions have shot up and in less than a week they are already about three inches high. The beans have also started to break out of the ground. It might be a good growing year. 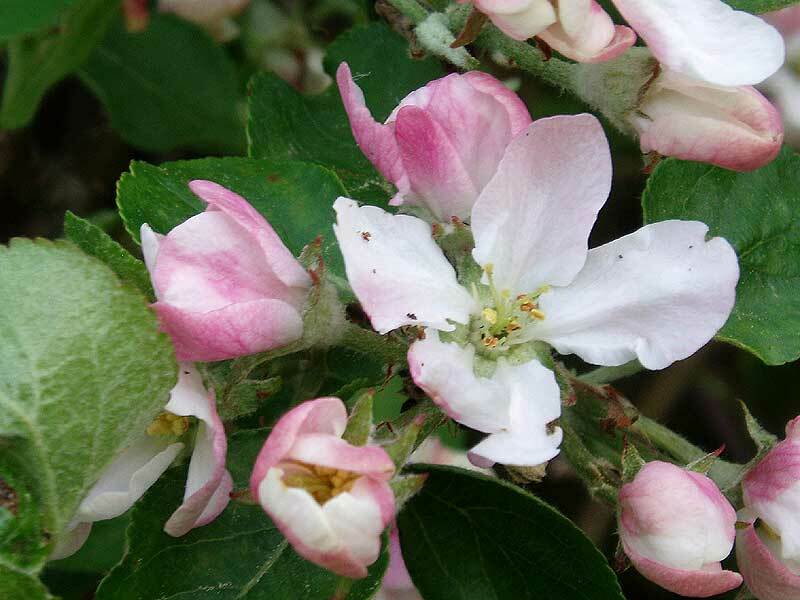 If you want to know which varieties we are planting you can find out here. 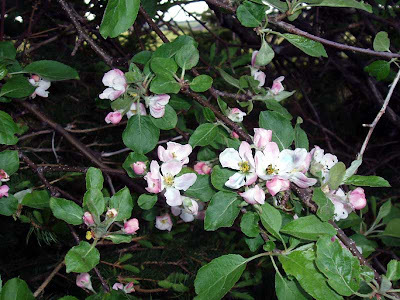 The wild apple trees are out in full blossom. The apple blossom is actually a very pretty little flower. The rest of the yard is starting to look lush again. The wild apple trees and the pin cherries are all out in full blossom and look great. 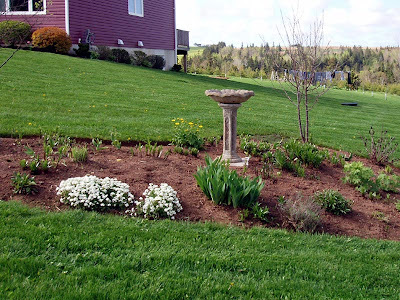 I spent hours last weekend working on the front gardens while Hubby was mowing the lawn. I got out all the weeds and added a layer of dark topsoil in around the purple phlox(?) and the daylilies. Hubby cleaned up the front garden and put up our birdbath for the first time since we moved here. Now it has a place of honor. I just have to clean it up and fill it with fresh water and watch the birds enjoy it. 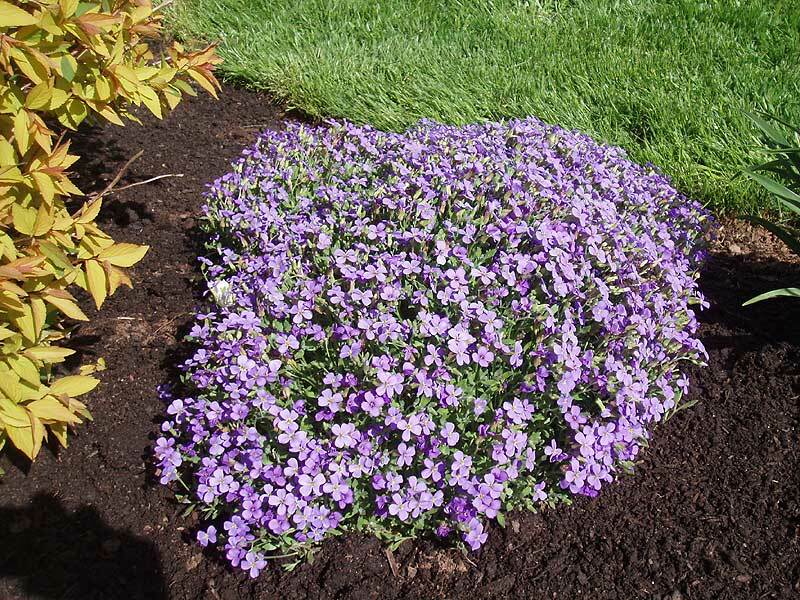 We think that this purple mound is phlox, but whatever it is, it’s beautiful. 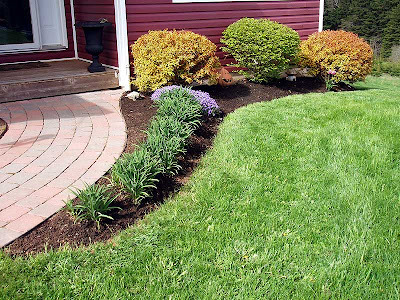 The front walkway garden has been all spruced up. After 5 years of lying in the side line the bird bath has been finally put back up. 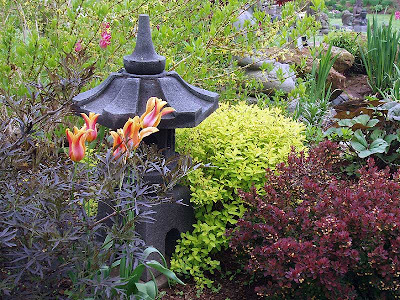 Yesterday was again cold and rainy (sigh) so we took a break and went for a tour around some of our favourite public gardens and nurseries for some inspiration. 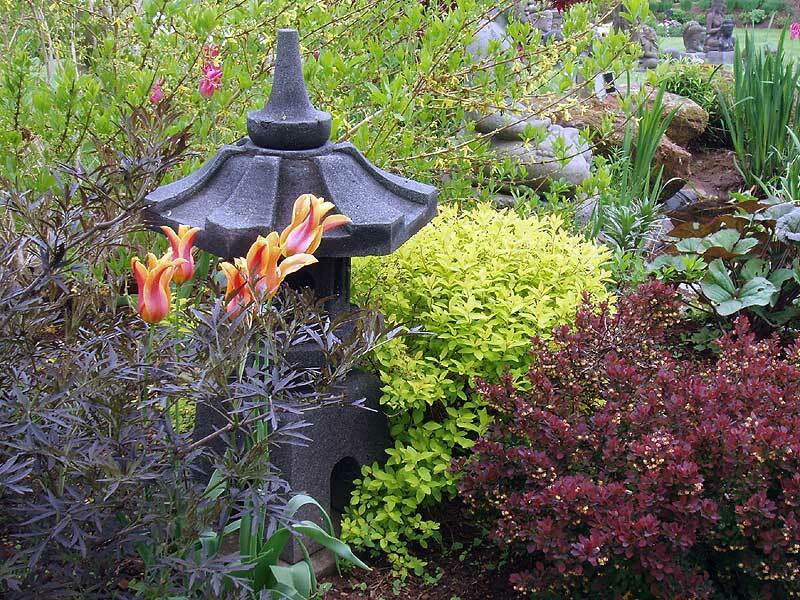 I am always surprised by the new varieties of flowers and plants you can come across in these places. These were a few of the prettiest ones I saw. 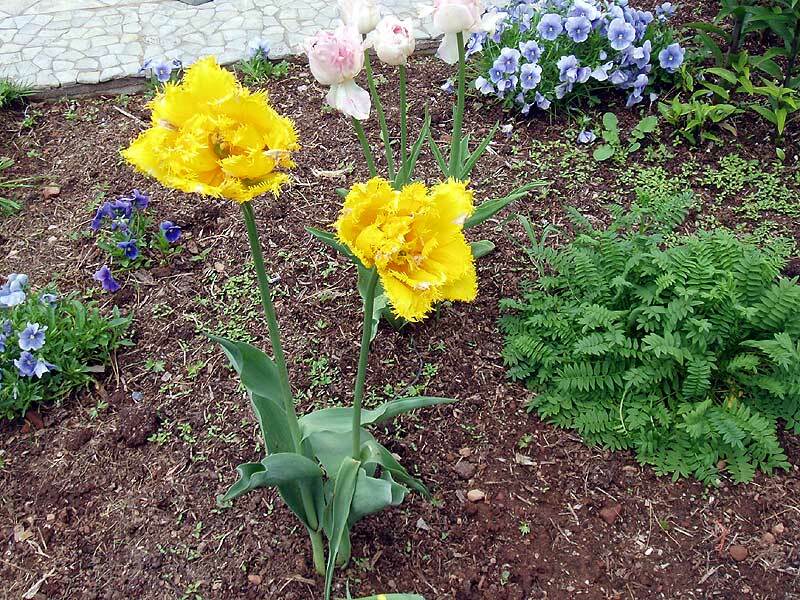 I think that these are parrot tulips but whatever they are, I wish they were mine. 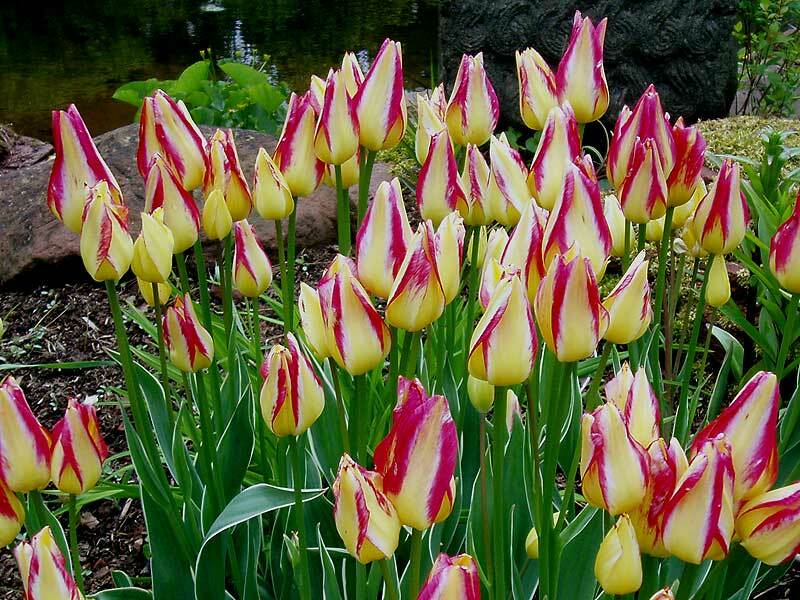 I love the frilly edges on these tulips. More beautiful tulips all set to open. My Mother sent me a Gnome house as a Christmas gift last year and this spring we put it in place on an outside tree near the end of the driveway. I love it and it makes me smile everyday as I back out or come home from a hard day at work. I just look over and smile, very therapeutic. Enjoy the pictures and have a great day. 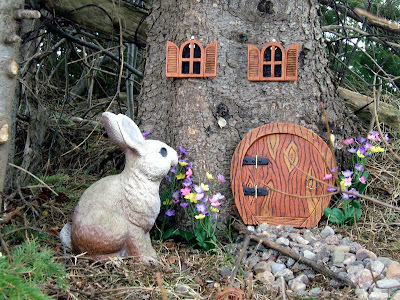 The Gnome House and its Guard Rabbit. Here’s the Gnome doing a little maintenance on his front walkway. HI WITCH!! I just loved this post...you have such a beautiful garden and yard...and that little gnome house...how cute...I want one! We've been busy here in Japan setting up house and putting my little English tutoring school together...I have not been online as much as I'd like to be. I have missed you!! hugs from Japan!! I adore your little gnome house. It's beautiful. So many other beautiful things to look at in this post. Thank you for sharing with us. Wow, how did you get Mrs. Hummingbird to be so still? I don't think i've ever seen their wings so clearly! I planted a little early and have lost most of my pepper plants to slugs. :0( And, it was a wee bit cold for some of the more tender plants. The seaweed i gathered seems to ahve helped with the slugs. I love that Wills and Kate have graced you for another year. When you write a post it's like 10 posts all put into one! A gardening update, a bird update, a weather update etc etc. Amazing shot of the hummingbird - I can never get them to sit still! 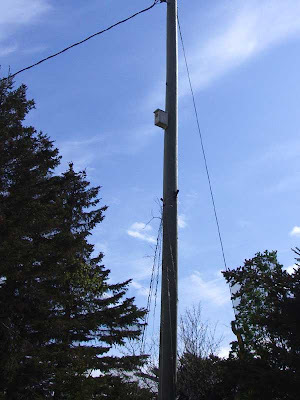 Couple of questions for you: someone told me to put up a few bat houses (?) to help with bug control - do you know if that helps? 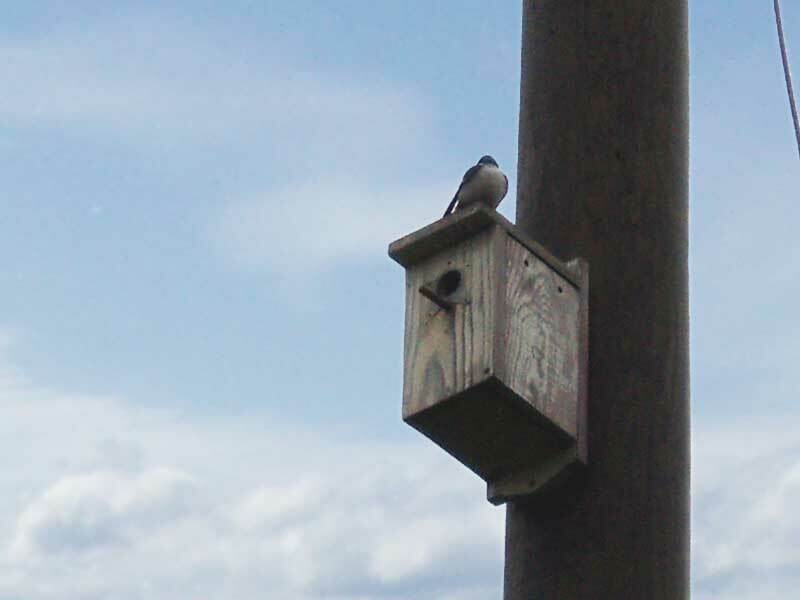 And secondly, do you know if there are any purple martins on the island? Your very tall bird house reminded me of them. Gotta get me a gnome house! I see that Mrs Hummer has impressed you as well! It is fairly easy to get a picture of them sitting on the feeder as they become quite used to us watching them from behind the glass. As long as we don't make any sudden movements they don't seem to mind us being there. They are much more concerned that another hummer will show up and try to steal a drink of THEIR FOOD! than they are of us slow moving humans. I can't really say whether or not there are Purple Martins on the Witch's Island. We only seem to attract the Tree Swallows but maps of the martin's range seem to show that it is possible. I know we do have bats. We also have a bat house on the western end of the potting shed. You can see a picture of it here. We never see the bats coming or going but Hubby left that window open one night last summer and in the morning it was covered in poop from something. Probably bat poop. I have to agree, fantastic photo of the hummingbird. I have such a hard time photographing anything that moves. Maybe it's a lack of patience. We have swallows that show up in the evening but I'm not sure where they're coming from. I would love to have a birdhouse like yours where they stayed regularly. AND - I wanted to let you know that I left an award for you on my blog today! :) Your site is definitely one of my favorites! Your garden is smashing. I just love to find a new bird in the garden every day. Your hummingbird photo is wonderful. 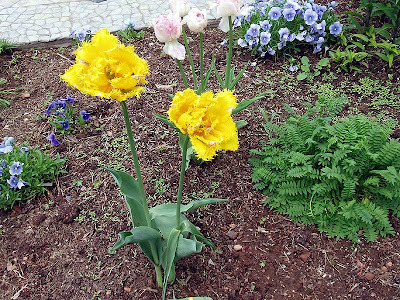 I have to agree with the frilly tulips that they are very nice. 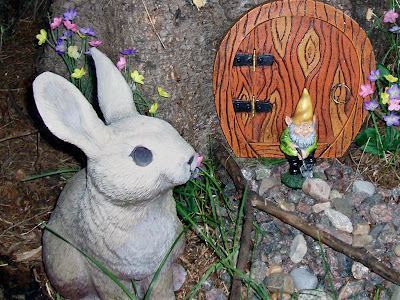 A good touch to the garden is a gnome house and yours is beautiful. Everyone is getting their garden ready, yards trimmed, houses painted and just making sure all is neat and tidy. The Royal Visit is going to be a special event. Thanks for the comments about coffee grounds and lily beetles. If they ever invade your neck of the woods, you will know what to do. 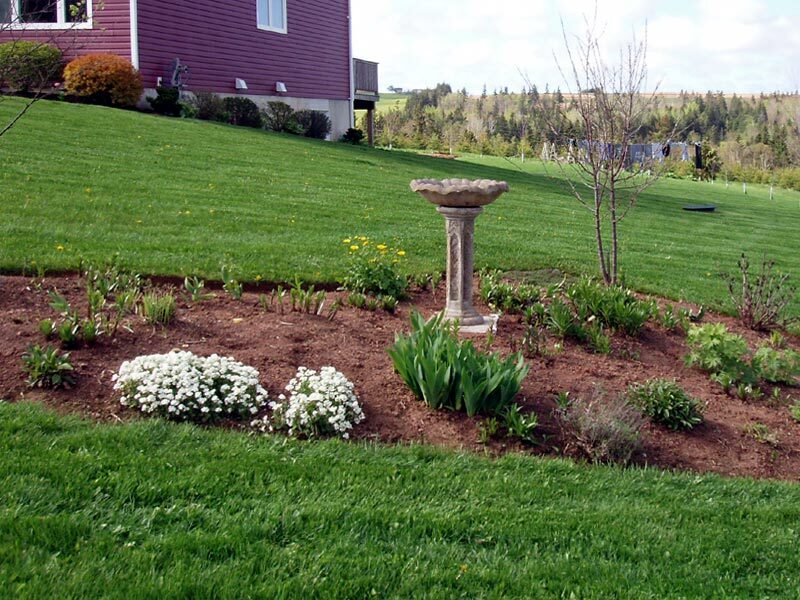 Your garden is beautiful - all ready for the garden tour! The hummingbird picture is perfect. It is very difficult to get such a lovely clear shot.